Update 2: Woke up this morning to find things still not working for either phone, along with about automated 35 text messages AND emails telling me to call support. Anyways, spoke with someone new, they once again reactivated the device. After 90+ minutes of waiting, now both phones seem to work. We’ll see how things go over the next few days/weeks. In the mean time Anandtech has an extremely in-depth tear down of the AT&T Microcell device. Update: 90 minutes became a few hours. Apparently during the activation process if you have a device AT&T has deemed invalid, the Microcell will NEVER complete activation. The lights will blink indefinitely. Upon calling AT&T they informed me their systems have determined my phone was not purchased through them, and therefore they can’t activate the microcell for it. Still waiting to see if Maru’s iPhone 3GS has the same issues, now that I’ve removed my phone from the ACL list. Since signing up for service with AT&T in November 2010, I have continuously had call quality and service issues. Prior to AT&T the same NexusOne device had worked reliably on TMobile’s network (albeit slow due to only 2G being supported). While not desirable I found ways to make it bearable while living in LA/Santa Monica. However since we moved to San Francisco in April 2011 the service quality has been unusable, especially at home. For the first two months here AT&T was insistant that all of the world’s problems end, including my coverage issues would end if I 1) Purchased a phone from them that had an AT&T logo on the back and 2) Signed up for contract. 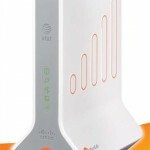 Finally late last week they gave up on trying to up-sell me, and I got a call from someone in customer service department offering me a femtocell (or as AT&T calls it “AT&T 3G Microcell“). 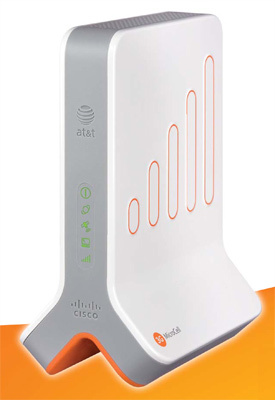 These are basically rebranded Cisco devices that provide a small 3G antenna in your home or office, and then route your calls via voice over IP. It only solves coverage issues at one location (home, office, etc). So it does not solve my issues with poor AT&T coverage or congestion while I am away from home. It only works with 3G phones, so if you are on an older 2G phone and have poor service you are out of luck. The device will refuse to work if it cannot get a GPS signal, so hopefully you have wired network drops near a window (Wifi doesn’t appear to be supported). They claim to use this validate your E911 address for emergency calls, but I imagine AT&T does not want you using it to avoid roaming charges while traveling either. GPS antenna extenders are available if you are unable to lock in on a GPS signal, but I imagine that isn’t really an option in most office building. You still pay for airtime/minutes at your standard rate even though all your calls are being routed over your OWN bandwidth. Calls will not hand off from a tower to your Microcell or between Microcells, but they will hand off from the Microcell to a tower if the tower signal is stronger. All of that being said I’ll still be a slightly happier customer if this works, and I can actually make and receive calls while in my apartment. I still think all devices/carriers should just come with UMA support out of the box so that you can just use wifi to complete calls and relieve the burden on their cel towers. Tmobile supported that on most of the phones I had over the years; but I haven’t seen many Android based phones offer it and as far as I can tell AT&T doesn’t support UMA period. Anyways, I just went through the setup which was relatively straightforward. Now I have to wait 90~ minutes before I can use it. Unbox the device and place it near a window where it has visibility to the sky. Plug it in to power and a ethernet port on your switch / router. Login to the AT&T 3G Microcell Portal (does not appear to work well with Chrome) and add authorized numbers to your device. You’ll need a magnifying glass or good eyes to read the serial number off the back of activation as well. Wait about 90 minutes for service to activate. Right now I’m still on the 90 minutes of waiting step. I’ll try to remember do a post in a few weeks once its actually online and I have had some experience with it. This server has received 4467210 hits from both ipv4 and ipv6.